Countess Narina Carvain wants you to find the Draconian Madstone. Go to the castle once your Fame is at least 10, and the herald will request that you speak with Countess Narina Carvain. The Countess informs you of an artifact that she wants you to recover. Follow the map past all the markers until you reach the underground tunnel to Pale Pass. Make your way through the fort. You will soon meet Akaviri Commander Mishaxhi. Deal with him and recover the artifact from the same room. Return to the Countess with the amulet to receive your reward. Once your fame is at least 10, you may hear rumors in Bruma about the Countess and her collection of Akaviri artifacts. Talking to townspeople about the subject will direct you to the Countess's herald, Tolgan, for further information. Such effort may not even be necessary, as Tolgan himself is actively seeking you out. He tells you that the Countess would like to speak to you and hands you a stipend of 25 gold coins. When you meet the Countess, she will inform you of her task: retrieve the Draconian Madstone. As a reward, she offers another item from her own collection. Once you accept the task, she reveals that she has the diary of a messenger sent to Pale Pass, the last known location of the Draconian Madstone. Talk to her about the topic "Diary". She tells you that she has already sent scouts looking for Pale Pass, and they found the first of the landmarks mentioned in the pages of the diary, Dragonclaw Rock. The Countess gives you a translation of the messenger's diary and a copy of a map sketched in the diary; a marker for Dragonclaw Rock is added to your map. Travel to the place that the Countess marked. The rock looks just like its namesake, a giant lizard foot. 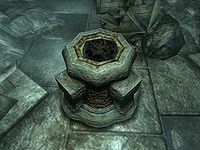 Whether you read the diary doesn't matter; your next step is to go due west from the dragon foot until you find a large statue called The Sentinel, the second landmark. From The Sentinel, go due north. It shouldn't be long until you find the third landmark, Serpent's Trail. The Serpent's Trail is an underground tunnel leading to Pale Pass. See the Pale Pass article for a map of this area. You may also find the messenger who penned the diary that has led you here, from whom you can take a set of Akaviri Orders. At the other end of the tunnels, you need only follow the winding path north to reach the ruins. There are likely to be a lot of Pale Pass Ogres. Once at the ruins themselves, search within the broken walls for the entrance into the Mouth of the Serpent. The article on Fort Pale Pass provides maps of this fort. Watch yourself inside the fort; it is filled with traps built so well that they work even now. Go from Mouth to Scales (or Eyes) to Fangs to Venom within the fortress. You'll be fighting Undead Akaviri Soldiers as you go, and will likely be hit once or twice by deadly traps, so this place can be a pain (and, annoyingly, the skeletons' Ruined Akaviri Blades are almost worthless). Once you finally enter the Venom of the Serpent, you will see the Akaviri Commander, Mishaxhi. Speak with Mishaxhi to find that he is still waiting for those orders. If you have them (see Serpent's Trail above), you can send him away by handing him the tablet. If you don't have the tablet, fighting him is also an option. However, if you give him the orders, any remaining Akaviri soldiers will stand down (die), and the fort will be put "at peace". The Commander is a ghost, so if you choose to fight him, remember that he is immune to normal weapons. After the Commander is dealt with, enter the room behind him and find the amulet on a pedestal in the back of the room. With amulet in hand, return to Countess Carvain. Your reward for bringing her the amulet is the leveled item Ring of the Vipereye, which fortifies your agility and provides you with a resistance to magic. When speaking to the Countess to initiate this quest, or to give her the Draconian Madstone, the relevant chat option will not be available if you have already activated the Defense of Bruma quest. It will however, become available again after the Defense of Bruma is completed. A non-Journal quest you can do concurrently is The Forgotten Chests of Pale Pass; it can be done before or after entering the fort and recovering the Madstone. After returning to the Countess, the Draconian Madstone will be placed in a showcase on the right side of her. When she looks the other way, you are able to easily steal it. You can also obtain the Messenger's Diary from the display case opposite. There are other guards and NPCs in the area, so strong Chameleon is recommended. If the Countess detects your skulking presence, she can turn to face you and the display case, clipping right through her throne. You may wish to wait until she retires for the evening. If you are caught with the stolen Madstone, it may not be in the Evidence Chest after your arrest nor re-placed in the case; it can simply disappear from the game. Its stolen flag can be cleared by Thieves Guild members, at some cost, by selling it to a fence then buying it back before the fence's inventory resets. Non-TG players with the Thieves Den download can also use Khafiz for this purpose. After you complete this quest, a special edition of The Black Horse Courier is published: "Pale Pass Discovery!". After Stage 100, when giving the orders to the Commander, all Undead Akaviri Soldiers will be replaced with Dead Akaviri Soldiers, who are identical save for their 0 health. Because they are separate entities, they can be re-looted for additional Ruined Akaviri gear to sell. The Akaviri Commander is hostile towards the Undead Akaviri soldiers. If you intend to kill him and didn't kill the soldiers on the way in, luring him to the previous room causes him to attack them and can provide you with a distraction, as he attacks them instead of you. The soldiers are unable to harm him, since they don't carry enchanted weapons. The quest reward, Ring of the Vipereye can never be dropped. Also, in certain quests that remove your inventory, if you are wearing it, it will not be returned with the rest of your inventory, but its enchantment will be applied to you as a permanent effect. If you steal the Akaviri Orders which is next to the Madstone in the display case after the quest, it will still be marked as a quest item, and can only be removed via console commands. A Wraith that is supposed to spawn after picking up the Madstone may spawn early, causing the Commander to attack, and/or run around the room, since he's unable to pass the hidden door. This makes it impossible to continue the quest, until the situation is resolved. Killing him willl cause the quest to resume as normally. Attacking the Wraith and exiting the room may cause it follow you through the door; after killing it and returning to the room, you may speak to the Commander normal. 2 I've learned that the Countess of Bruma, Narina Carvain is the collector of Akaviri artifacts. Apparently, she's seeking a particular piece to add her relics. The townsperson I spoke to recommended I seek out Tolgan, her steward, if I was interested in retrieving the piece. 5 I've met a Nord named Tolgan. Apparently, he's the herald of Countess Narina Carvain from here in Bruma. He presented me with a stipend of gold, and a request from Lady Carvain to meet her at the castle. Not wanting to offend the Countess, I should accept the request, and make my way there when she holds court. 10 Countess Narina Carvain has told me that she's seeking a particular relic of Akaviri origin: The Draconian Madstone, an amulet that supposedly grants the wearer immunity to poison. It's recently come to her attention that it may be located in the ruins at Pale Pass. She's offering a substantial reward for the talisman's return. I should speak to her for more information. 13 I've declined Countess Narina Carvain's offer for now. She said I could return at any time if I wish to change my mind. 15 I've accepted the task. Countess Carvain revealed that she has the diary of a messenger from the original Akiviri [sic] army that marched on Cyrodiil at the end of the First Era. 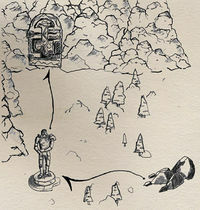 The messenger's diary supposedly gives clues to the location of the ruins at Pale Pass. The Countess has provided me with a map, a translation of the diary to use as a guide and a key that may unlock a door at the site. 20 Countess Carvain has told me that her scouts have already located the first landmark mentioned in the diary, Dragonclaw Rock. It's been marked on my map, so I should begin the journey from there. 30 I've arrived at Dragonclaw Rock. I should consult the messenger's diary to learn the way to the next landmark. 40 I've reached the second landmark, The Sentinel. I should consult the messenger's diary once again to discern the way to the third landmark. 50 I've found the third landmark, The Serpent's Trail, which seems to be an underground passage. I'll need to traverse this passage if I'm to find the ruins. 60 I've discovered the body of the messenger who penned the diary I've been carrying. 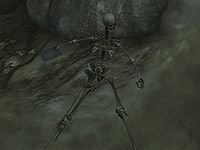 Even though he died over a thousand years ago, the bones have been well preserved by the frost in the caves. He seems to be clutching something in his bony hand. I should investigate. 70 Near the body of the messenger, I've discovered a slate tablet with what appears to be Akaviri writing on its surface. These must be the orders the messenger spoke about in the diary. 80 I've emerged from The Serpent's Trail and find myself face to face with the legendary Pale Pass. A path winds down into the snowy valley. If I follow it, it should lead me directly to the ruins. 85 I've discovered the crumbled walls of the once mighty Fort Pale Pass. It appears to have been destroyed by a landslide long ago. I should proceed into the ruins and search for the Madstone. 90 The ruins appear to be infested with undead Akaviri. I don't know how long they've been trapped here, but I should proceed with caution. I need to locate the Akaviri commander of the fort who is said to possess the Draconian Madstone. 100 After seeing the orders, the Akaviri Commander vanished. The ruins are now silent and at peace. After so many years, the Akaviri's final mission has been completed. I should proceed ahead and search for the Madstone. 105 I've destroyed the commander of the Akaviri fort. I should proceed ahead and search for the Madstone. 110 I've obtained the Draconian Madstone. I should now make the long journey back to Countess Carvain in Bruma. 150 Yes I've given Countess Carvain the Draconian Madstone. She was extremely pleased, and rewarded me with an Akaviri artifact from her personal collection called the Ring of the Vipereye. It is possible to use the console to advance through the quest by entering setstage MS12 stage, where stage is the number of the stage you wish to complete. It is not possible to un-complete (i.e. go back) quest stages. See SetStage for more information. This page was last modified on 24 December 2018, at 12:47.